Starting February 1st Schnepf Farms will open their orchards to the public to share the sweet smell of the peach blossom. During this experience, many can enjoy the beauty of over 80 acres of peach trees that are in or just beginning to bloom. 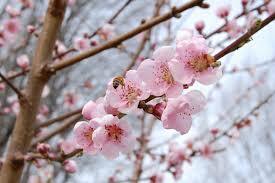 Trees dotted with pink and white blossoms giving off the sweet aroma that resonates honey and almonds. The blossoms can be found once a year usually during the early spring months. During this experience, visitors can enjoy guided trolley rides with a personalized tour with farm owner, Mark Schnepf. They also offer walking trails, train rides through one of the orchards, hayrides, bike trails, and many more fun activities for the whole family to enjoy. Be sure to stop by the country store and bakery to pick up some peach blossom all natural honey, peach salsa, peach pies, and more wonderful peach products. Schnepf Farms is the largest peach grower in the state and are pesticide free and all organic. Also, don’t miss out on their UPICK “certified” Organic Garden. For more information about the Peach Blossom Celebration, Prices, Directions or any other events offered at Schnepf Farms check out their website. Looking for more fun activities for the family? Check out our fill your plate blog. This entry was posted in Arizona, Arizona Food and Farm Events, Fun and Games, Just For Fun, Kids and tagged Arizona, Celebration, Family, Fun, Peach blossom, Queen Creek. Bookmark the permalink.